The Tahune Adventures site and the surrounding forest area have been impacted by the January Bushfires and will be closed until further notice whilst they re-establish aspects of the site that have been damaged. Tahune Adventures will be reopening late in the year with a revitalised and renewed Tahune Adventures Tasmania. Walk high above the forest canopy and share the lives of the forest giants from up-close – look down to the place where the wild waters of the Huon and Picton Rivers mingle. 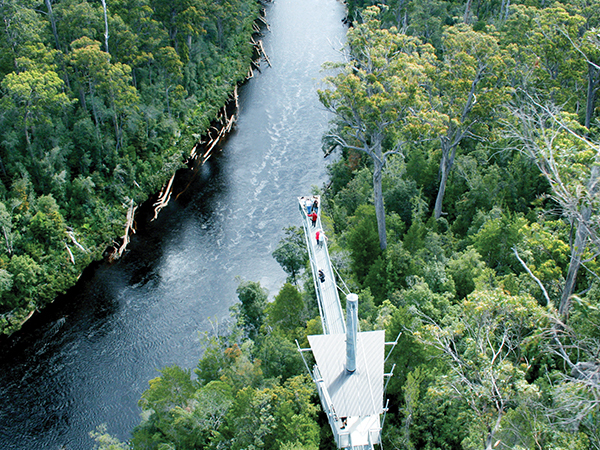 The 600-metre walkway ends at a spectacular cantilevered platform, 50 metres above the riverbank – the views extend to the mountains of the Tasmanian Wilderness World Heritage Area. 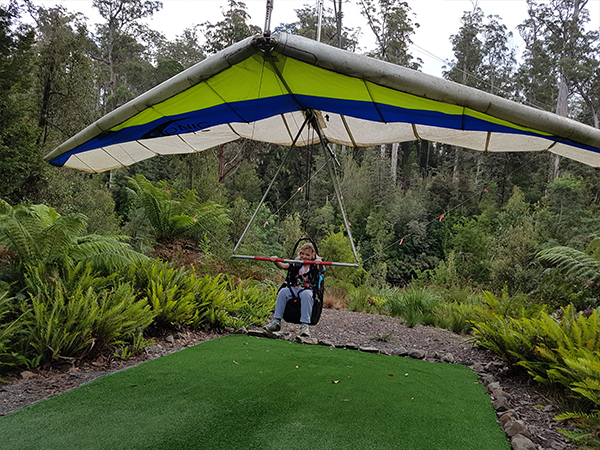 Soar like an eagle from a lofty perch high in the treetops – feel the wind beneath your wings as you dip and swoop on a thrilling 400-metre glide across the Huon River. 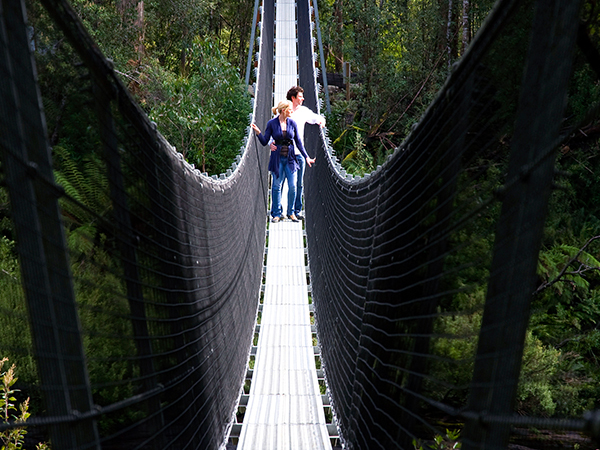 Follow the forest and riverside track to cross two swinging suspension bridges across the rushing waters of the Picton and Huon Rivers. The churning, tannin-coloured water beneath your feet began as rain and snow, deep in the Southwest wilderness. Take a break to enjoy local Tasmanian food and wine. Try Tasmanian salmon and honey – taste the Huon Valley’s wonderful cool-climate wines and local cider. Pause for a snack, light meal, tea, coffee or an ice cream. Browse in the gift shop – choose a piece of Huon pine with its unique scent to remind you of your visit. 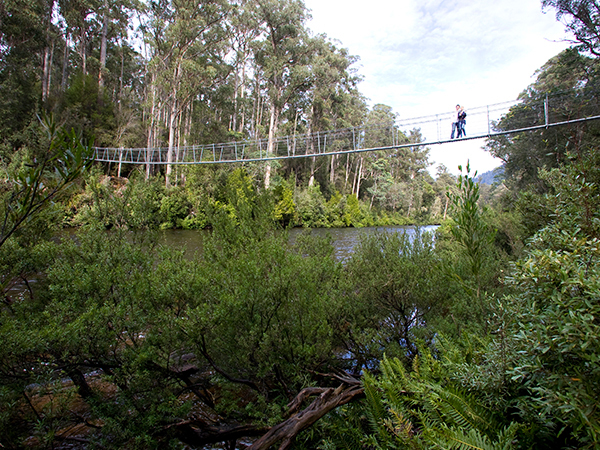 River, forest sky – discover them all at Tahune Adventures Tasmania. Although this tourist development has changed the area, it is still a popular place to picnic in one of the many shelters or tables, while cooking lunch on a gas barbecue. Beyond Tahune Reserve (*gates) is the Warra Long Term Ecological Research site. This area is part of a worldwide forest monitoring and research network established under the United Nations Environment Program. More details can be read on the Huon Trail sign located in the picnic area, near the start of the Huon Pine Walk. 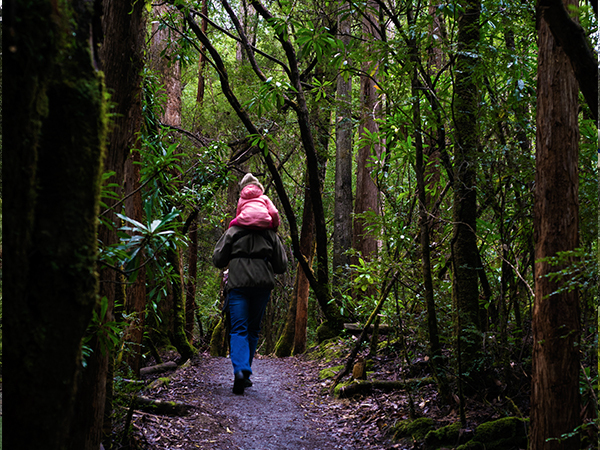 This 20 minute loop walk is easily managed by most people and is the easiest place in Tasmania to see young and mature Huon pines growing in their natural riverine rainforest environment.